Zinwell DIRECTV Approved 6X16 Wide Band Satellite Multi-Switch!!! 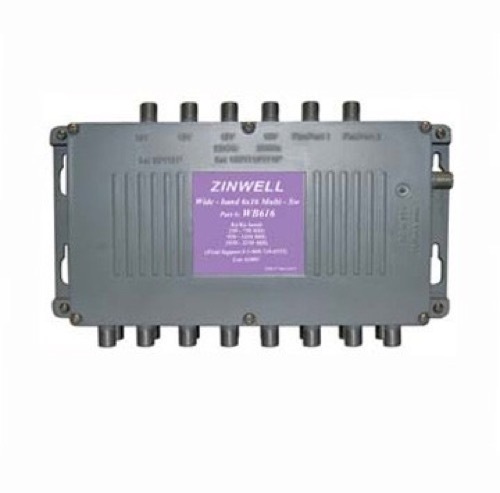 The Zinwell MS6X16WB-Z is a DIRECTV approved, 6 x 16 Multi-switch, designed to expand the new Slim Line Ka/Ku outdoor dish antenna from 4 outputs to 16 outputs, supporting up to 16 independently operating receivers. The Ka/Ku outdoor unit is designed to support the latest DIRECTV A3/MPEG-4 capable HD receivers as well as all previous DIRECTV dish antennas. The Ka/Ku outdoor unit has the traditional 101/110/119W LNBs and two additional Ka LNBs for 99W and 103W satellites. The actual signal availability varies depending on user location and DIRECTV satellite deployment data.